This recipe is courtesy of the label on a jar of Kraft All Natural peanut butter. I was amused that the particular kind of peanut butter that the recipe called for (crunchy) was on the label for a jar of a different kind (smooth), but considering how these cookies turned out I’m confident enough that either variety would work fine. 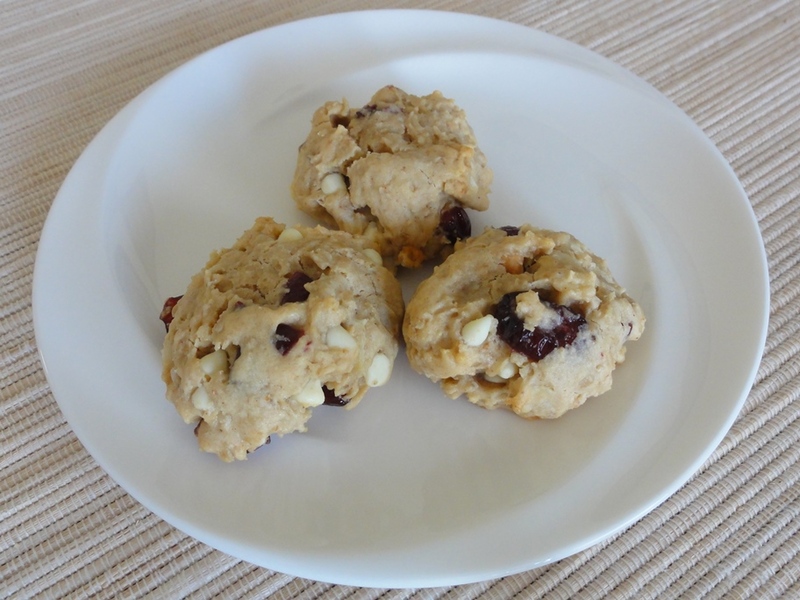 The original recipe, “Morning-on-the-Go Cookies“, looked to me to be the kind of recipe that could involve a little bit of everything, so I experimented with the extra ingredients folded in at the end to come up with this variation on the original. 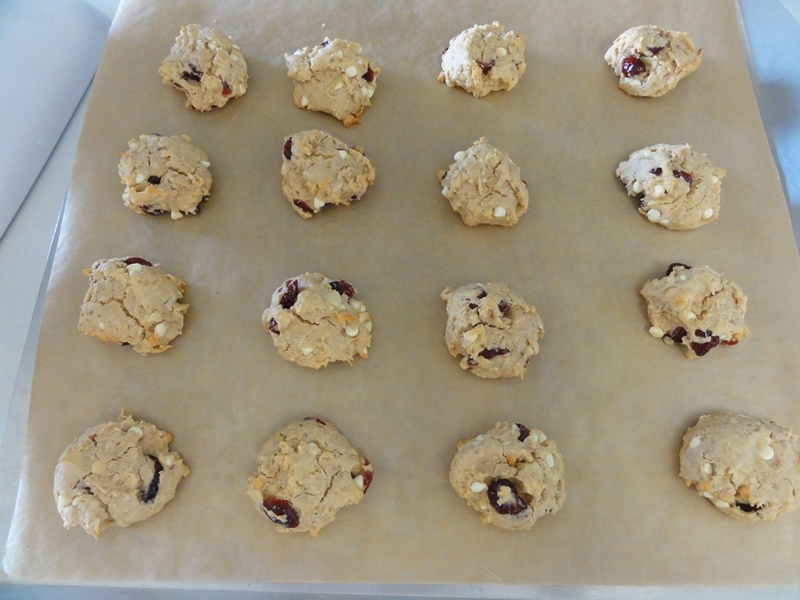 The first batch of these that I made included the coconut, almonds, and cranberries specified in the original recipe. I didn’t have any pistachios on hand and I figured dried cranberries were better on their own than being mixed with raisins. The combination of flavors with coconut and peanut butter didn’t work that well for me though, so I decided to make these somewhat unhealthy by swapping the coconut for white chocolate chips and doubling the quantity. I also upped the flour content, to push the end result closer to the consistency of the Oat Chocolate Chip Cookies that I’m very fond of. 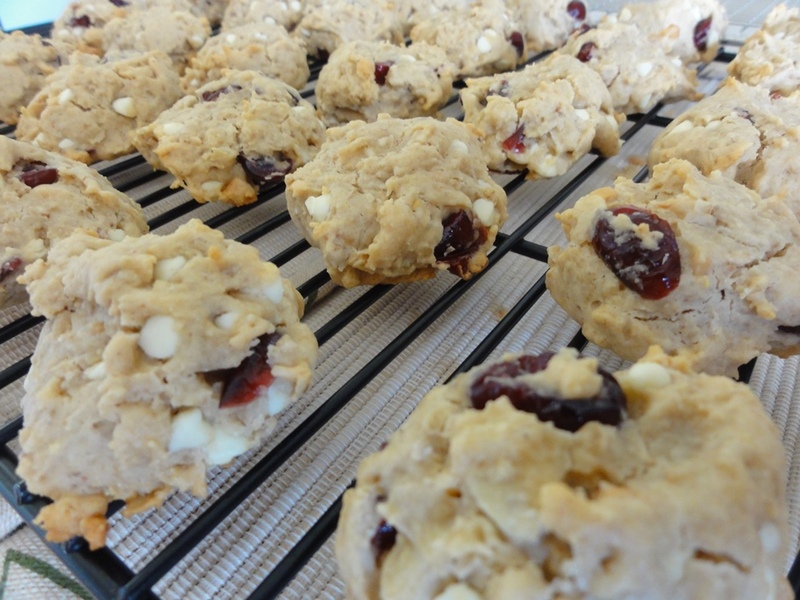 The second batch turned out great, with the peanut butter, white chocolate, and cranberries coming together in a delicious combination. 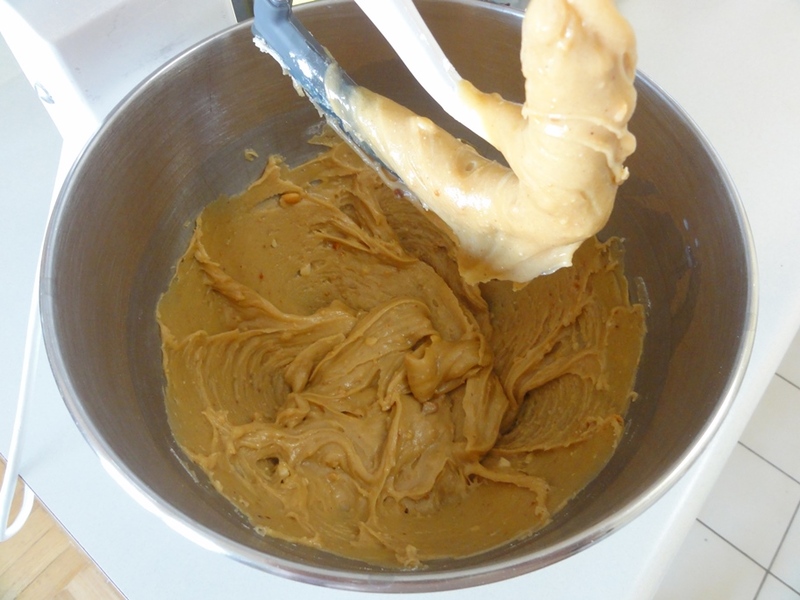 Beat together the peanut butter, honey, butter, vanilla, and egg, until well-combined. 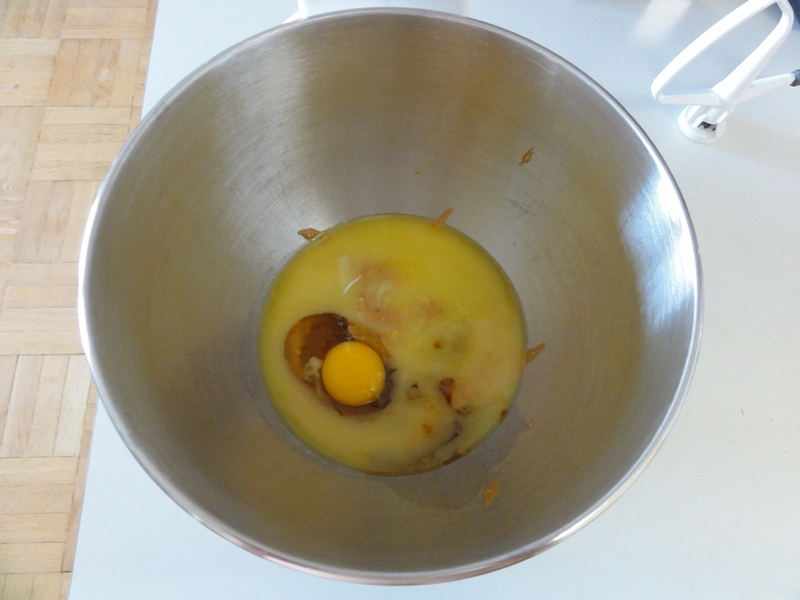 Add the dry ingredients to the wet, about a 1/4 cup at a time, blending until just-combined each time. 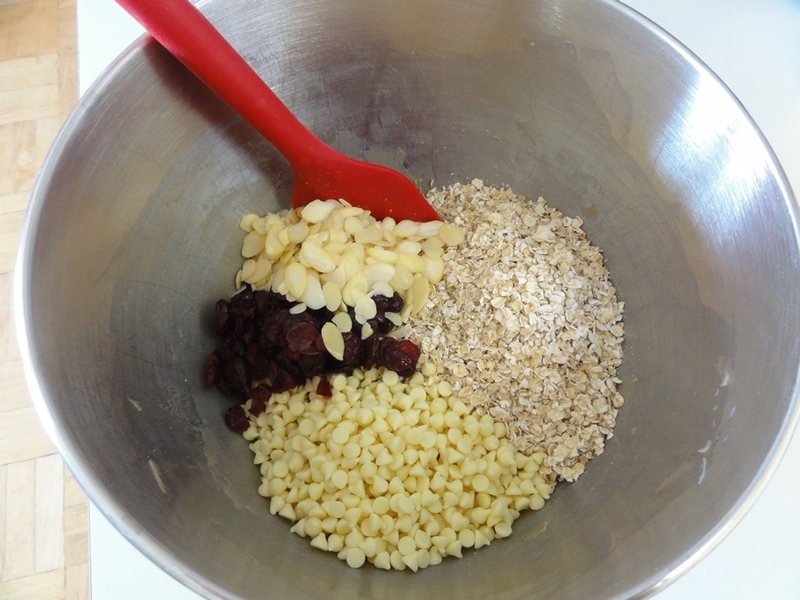 Fold in the oats, white chocolate chips, dried cranberries, and almonds. 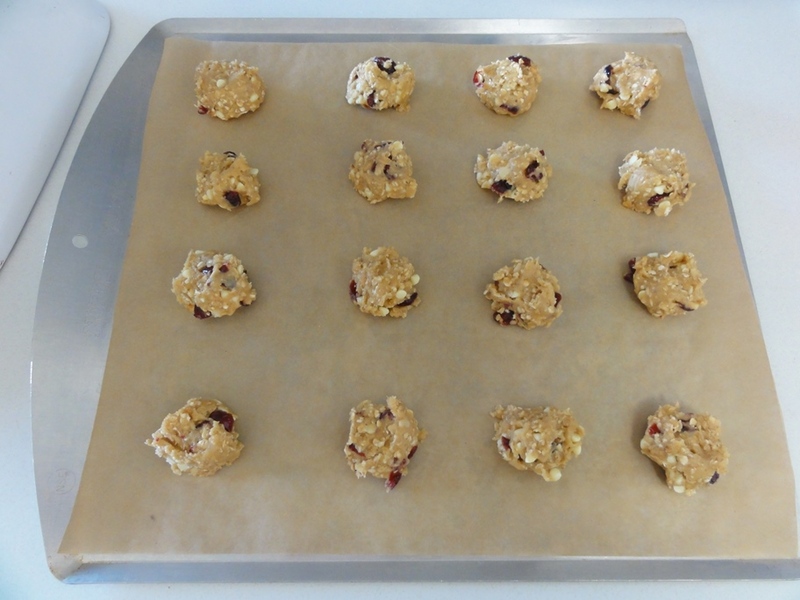 Drop tablespoon-sized amounts of dough onto the baking sheets. Bake for 9-10 minutes until the edges are just starting to brown. Let cool for 5-10 minutes on the trays and then transfer to wire racks to cool completely. The peanut butter recommended by the original recipe has no added sugar or salt; it’s just peanuts. I don’t expect the consistency of the cookie would change too much if you used peanut butter with sugar in it, but it would certainly be sweeter. A 1/2 cup of honey is a glorious amount of honey, then there’s all the white chocolate and cranberries, so there’s plenty of sugar already involved and I suggest trying these first time with the natural variety of peanut butter. Peanut butter can be a messy thing to measure into a cup, so for the first batch I made I took the opportunity to find out how much a 1/2 cup of crunchy peanut butter weighs. Working with weight for that kind of thick, mostly-liquid ingredient is easier than volume, plus there’s one less measuring cup to clean, so I weighed out the honey, too. At that point everything was on the table so I weighed melted butter, just for the fun of it. This recipe is not particularly delicate, so although your mileage might vary a little from mine depending on the brand of the ingredients you use, these weights should suffice. I chose slivered almonds over the whole implied in the original recipe because I figured that whole almonds would dominate the texture of the cookies. Although the slivered almonds did not seem to add much flavor (the peanut butter and cranberries are rather dominating in that respect) I do think that they add a nice bit of crunch in addition to the already crunchy peanut butter. That all being said, if you don’t have almonds handy you can certainly leave them out without greatly affecting the end result. 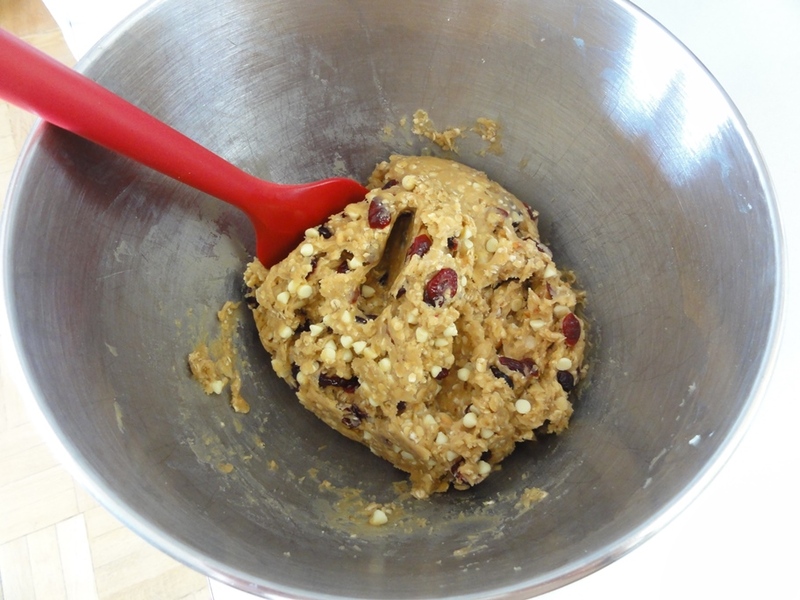 The first five ingredients piled into the bowl aren’t particularly appetizing to look at, but once blended together the nascent cookie dough at least smells great. There’s no convenient dry ingredient that’s a different color to serve as a marker of when the flour has been thoroughly whisked together. 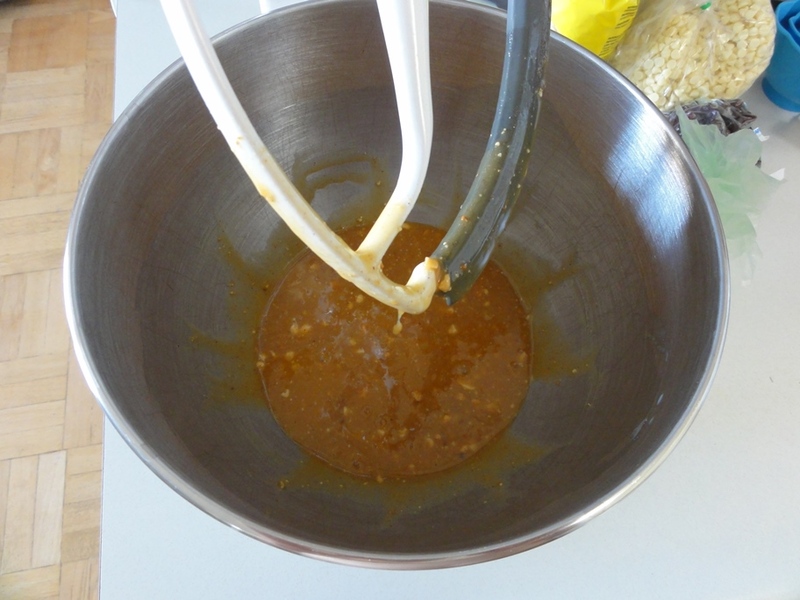 Whisk briskly for a minute or so and it should be fine, or throw in a 1/4 tsp of cinnamon and it’ll be readily apparent by the consistent color that you can stop whisking. 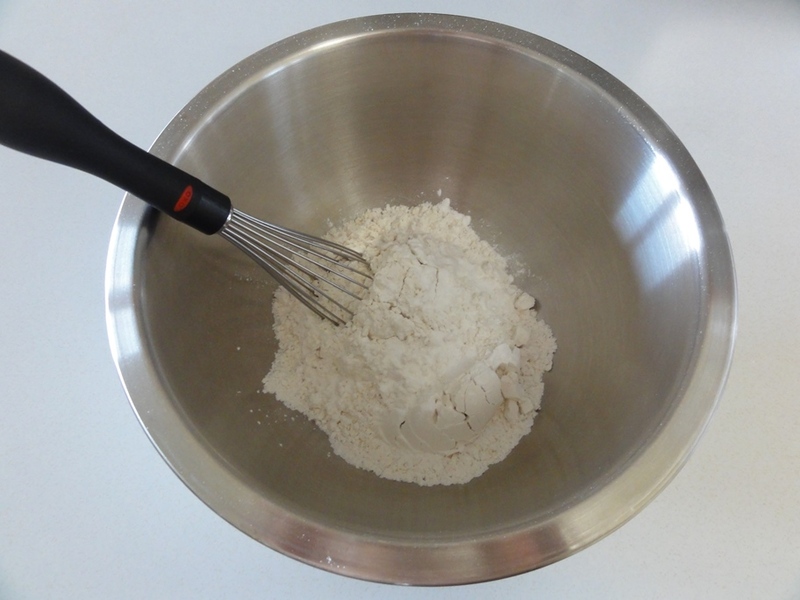 When adding in the dry ingredients it helps to go slowly and add a little bit at a time, to avoid spraying flour all over the kitchen counter (and yourself). 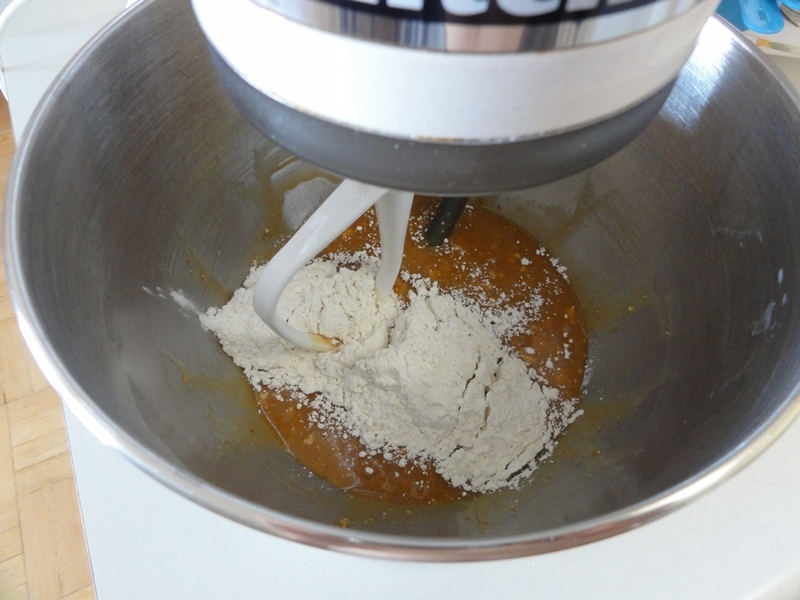 Blend it all together until there are no more traces of flour; the consistency will have returned to something fairly close to the original peanut butter. I gave these cookies plenty of room in case they’d spread out a bit. As it turned out they barely moved at all, so you could likely pack a few more onto each sheet. When they’re done, the edges and any bits sticking out from the tops will be turning golden brown. Although its hard to tell at this point, the bottoms are similarly golden brown. How short this step-by-step section was shows just how easy these delicious cookies are to make!